I came up with a new creation...and it's delicious! 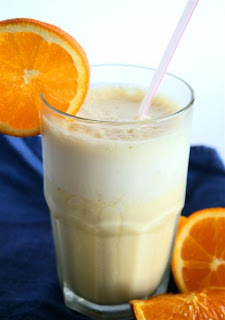 Tastes just like (ok, pretty close) an orange julius! And it's a great way to sneak in extra protein, or curb hunger between meals. I love me some protein shakes! Combine all ingredients in a blender & enjoy!